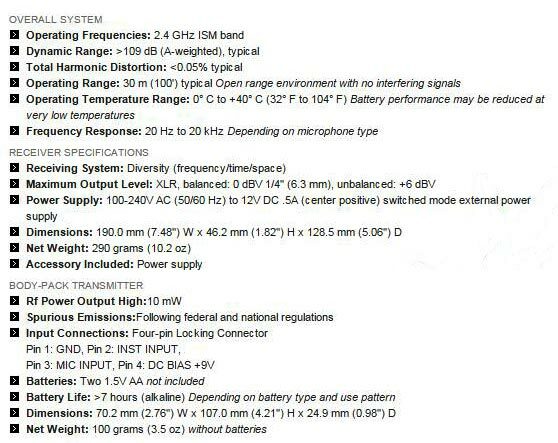 Audio-Technica’s ATW-1101/H92 Belt-Pack Radio Mini-Headset System is part of their System 10 Series of radio microphone products. 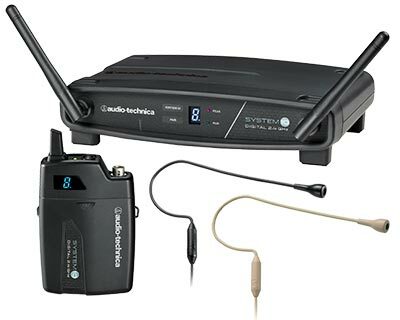 This is a digital high-fidelity wireless system designed to provide performing musicians and presenters with advanced 24-bit operation, easy setup and clear, natural sound quality. Operating in the 2.4 GHz range - the same as your Wi-Fi - and outside normal RF interference, the System 10 ATW-1101/H92 Belt-Pack Mini-Headset Radio System offers extremely easy operation and instantaneous channel selection. Up to eight channels may be used together without any frequency coordination problems or group selection issues. System 10 receivers and transmitters offer an easy-to-read digital ID display and stackable, contemporary styling. The ATW-1101/H92 Belt-Pack Radio Mini-Headset System comes in two versions: choose model ATW-1101/H92 for a system with a black mini headset or model ATW-1101/H92-TH if you'd like your system to come with a flesh coloured mini-headset. Please go to our webshop below to select either of these two models.